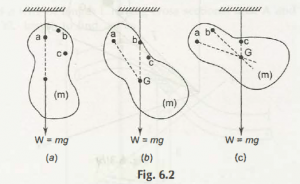 With reference to figure 6.2 the body of mass is stopped by the cord which are not extended from point a. The W is denoted by W = mg which will act on vertical basis moving downward. A dotted line is drawn by us from point a moving downwards, and then the body is separated from the point c respectively. All the lines which are drawn vertically meet at one fixed point in above figure b and c at point G which is called Center of Gravity. 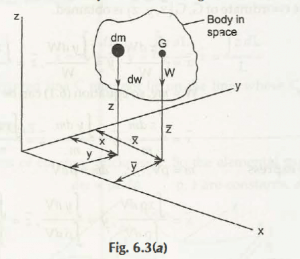 Equations (6.2), (6.3) and (6.4) have no reference about ‘g’ (gravitational effect). Therefore, we can come across with unique point (X, y, Z) which is called as the centre of mass. 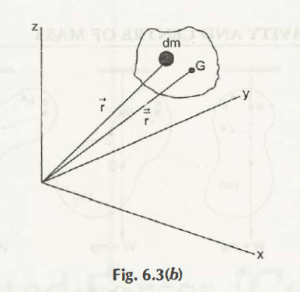 The centre of mass interlinked with the centre of gravity as long as g remain constant.